The move to Wordpress brings with a learning curve that I am currently working through slowly. Initially I thought I wouldn't be able to figure out how to build a site, create pages, assemble photo galleries, etc., but I'm doing it, albeit slowly. The panic that set in after I dove in is subsiding a bit and I have no doubt I will come on the other side of this just fine. For the present, it is a work in progress. I eventually plan to sell my work through the site but that's still down the road a ways. For now, baby steps. Although the site is still incomplete, I have managed to put up a blog post where you can read more about the golden mask you see in the photo. You can find it here or you can click the hyperlink under the photo cation above. Please go check it out, leave me some love in the comments section and subscribe. And share it with your friends. Every little bit helps. See you at my new address. As I had predicted in my last blog post, February was indeed a very busy month but not for the reasons I had thought. My assumption was that the various minor holidays that take place during February would keep me busy creating projects for the members of the Dorchester Senior Citizens Center crafting class. 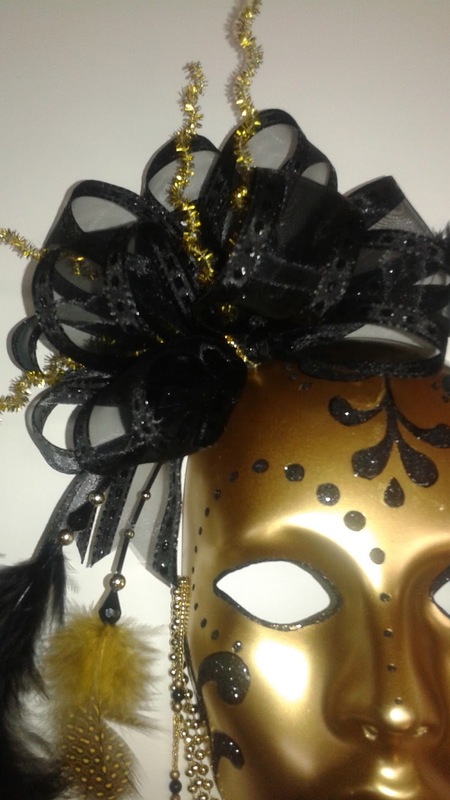 (See the photo below of the Mardi Gras masks we made at our last class.) Unfortunately that was not the case. You see, while I was up on a ladder decorating the center for Mardi Gras, I fell off and broke my left knee. I was lucky to get away with only a broken knee. It could have been much, much worse. Anyway, the knee required surgical repair. 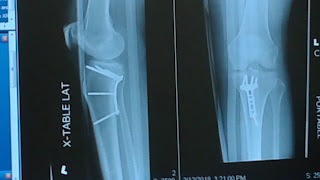 The x-ray image you see here shows the plate and screws used to hold the pieces of my broken knee in place while it heals. I was released from the hospital after a week to continue my recuperation at home and I've been laying in bed most of my time keeping my leg elevated to help alleviate swelling. I can not place any weight whatsoever on my leg for at least two months, maybe longer depending on how well I heal. My seniors show off their Mardi Gras masks. On the bright side, I'm slowly getting better and I have a bit more mobility in my knee every day. Three weeks post-surgery follow up determined that I have up to 80% flexion in my knee. I'm getting around a little better each day but that's not to say I'm ready to run. I have to use crutches or a walker to move around. Going up and down stairs is still challenging but I manage. I still have problems standing in one place for any length of time because it places great stress on the one leg that is supporting me. It also places stress on my left hip which must hold the left leg off the floor so as not to place any weight on it. This fatigues me quickly and I feel like a limp noodle. One thing is for sure. When this is all over, I won't be climbing any ladders any time soon. Anyway, there won't be any craft projects with my seniors for the foreseeable future, something that greatly distresses me but can not be avoided. Hopefully I'll be in a position to do some crafting on my own in the near future which I will share with you. Until then I hope you'll stick around for the next chapter in my crafty life. Many thanks. Our crafty mavens at the Dorchester Senior Citizens Center have started 2018 with a couple of cards that highlight the gleaming sheen of metal. "Precious Metals" features metallic card stock in gold, silver and copper colors. The silver cardstock, in particular, looks like vintage pressed tin when it is embossed. The tiniest bit of black card stock peeks out from under the embossed pieces to offer a bit of contrast to the creamy white base card layer. These crafters love their "LoveBirds" card. Our second card takes a look ahead to one of the many minor holidays that occur during the month of February. This love themed card comes just ahead of Valentine's Day on February 14th but the color scheme makes it a perfect choice for a wedding or anniversary card. The silhouetted love birds on a branch and the sentiment "Always and Forever" undeniably make this card one for lovers. Like the previous card, this one also features silver card stock with just a touch of gold and some sparkling rhinestones for accent. Not shown is the inside card liner which also has subtle silver and gold accents. 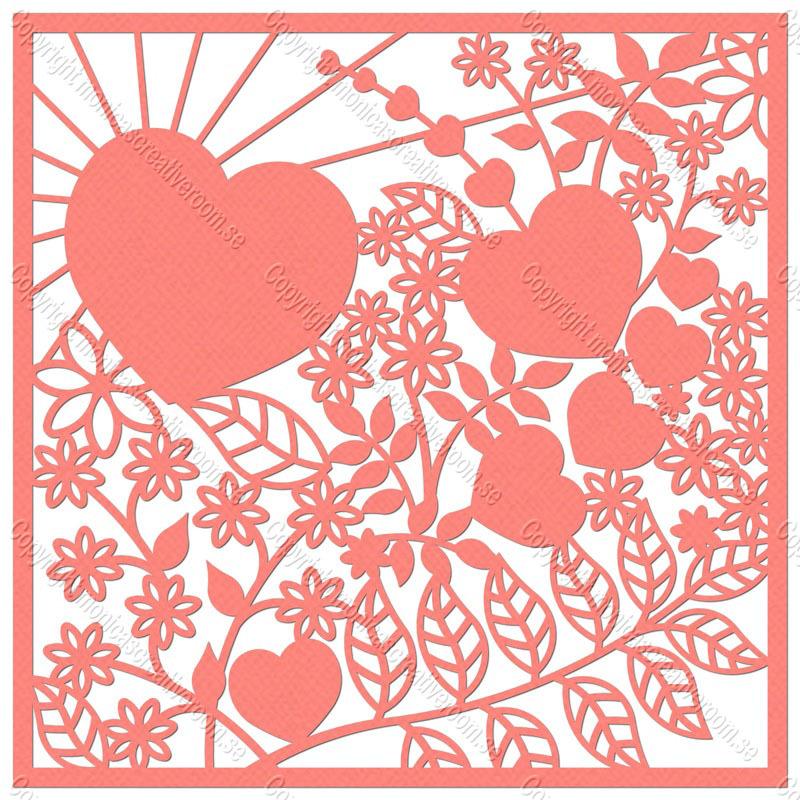 I made an large poster-sized version of this card in traditional Valentine's Day colors to use as part of the senior center decorations. Here they are, side by side, so you can see the size difference. Also on the calendar for February are Mardi Gras on February 13th and Chinese New Year on February 16, not to mention President's Day on February 19. It's going to be a busy month. In my last post, I was bemoaning the speed with which Thanksgiving was approaching. Well, now Hanukkah and Christmas have come and gone and New Year's Eve is upon us. Am I the only one who thinks this year went by with blinding speed? At the Dorchester Senior Citizens Center, they have a party at the drop of a hat so the holidays were just another reason to turn on the music and dance. In between the music and the revelry, we managed to find time to craft a thing or two. The group displays their reindeer cards. We began the winter crafting with glittery snowflake hanging ornaments. These were hung around the center when completed. The snowflakes were followed by oversized gift tags the featured a three dimensional Christmas tree complete with rhinestone baubles and a glittery star on top. Christmas crafting wouldn't be complete without a Christmas card so we made one with a reindeer sporting beautiful curlicue antlers that were glittered to make them really stand out. livens up the party with confetti. Once Christmas crafting was over, we focused on the new year, creating a hand held sign a festive Happy New Year on one side and glittery stars adorning the back. A New Years party, complete with music, dance and confetti, was held at the center during our craft class and the joyous soca rhythms were a happy distraction. Everyone danced a bit, sat down and made a hand sign, then got up and danced some more. Many thanks to JoAnne Biswakarma and the wacky sense of humor she brings to every Dorchester Senior event. She really livens up the party. Here's to another year over and a new one just begun. Happy 2018, everyone! See you again next year. Is It Here Again? Already? It seems impossible to believe but next week is Thanksgiving. NEXT WEEK!! It feels as if I was just setting out seedlings and applying sunscreen last week. Time is truly moving faster and faster every year. Ugh, that means I'm getting older and older just as fast. Hmmph! On to happier thoughts. At the senior center, we've been working on all sorts of Autumn themed projects for several weeks now. In my last post there was a picture of the beautiful floral pumpkin centerpieces my crafters created. We followed that up with a coordinating Thanksgiving sign that can be posted on a wall, a door or on an easel for display. At our last session, we took a short respite from the larger, more complicated projects to create a very simple card to celebrate the fall season but, to keep my class from being bored, I challenged them to decorate it in glitter and they did a wonderful job. Our upcoming class will be the last session before the Thanksgiving holiday and I have created a cute little turkey decoration. It's rather small, measuring only 2.5 inches tall by approximately 4.25 inches wide, but what this little fellow lacks in stature, he makes up for in attitude. His body is a small pinecone. His head features an open beak with a nice wattle and wide eyes, but it's his tail that steals the show, made up of 28 individual paper feathers highlighted with contrasting ink. Even the back of his tail is fancy, adorned with a lacy half medallion. A full medallion is used as a stand for this fancy fellow. Yes, Thanksgiving is here and you know what that means...Christmas is around the corner. Bring on the holiday crafting. It's Been a Long Row to Hoe. I haven't posted in a long time, not because I haven't had anything to post but, on the contrary, because I've had too much going on. Unfortunately, not all of it has been good. In the past six months there have been at least five funerals, three of which were family or friends close enough to be family. I kept up with my senior crafting class during that time to keep myself from dwelling on sad memories, knowing that the sadness would pass and life would go on. I am happy to report that this time of reflection coincided with some of the best crafting projects we've ever done at the senior citizens center. The class has grown and I have a absolutely wonderful group of people to work with. Here are some of the creations we have made since my last entry. There are many more photos on my Facebook page as well as on my Pinterest board, Crafting with Senior Citizens. Why don't you check them out and make a comment or two? It would be greatly appreciated. Thanks. Since my last post, there hasn't been whole lot of crafting going on. That's because I was away for three weeks tending to my daughter who was recuperating from major surgery, and caring for her two young sons. Those boys very nearly put me in traction, they are so rambunctious, but I managed to hold my own and tame them somewhat. 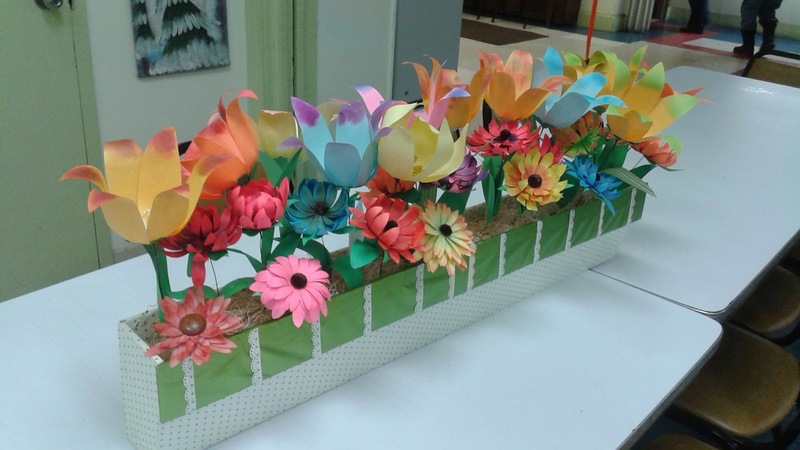 Before I left and since my return, the paper crafting focus at the senior center has been on creating flowers. Six years ago I created a faux window box for the center that was filled with flowers made by the seniors in my classes. In the years since, the flowers in the window box have become a little worse for the wear and it was time to replace them. 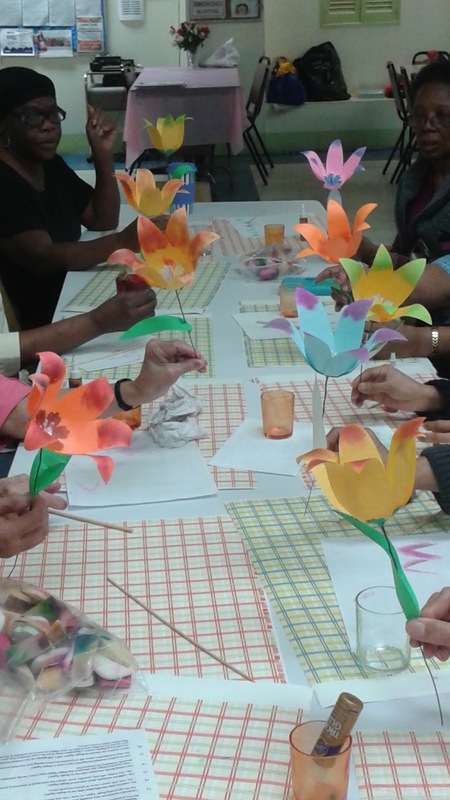 That was a perfect segue to some classes on making paper flowers. My ladies created beautiful colorful blooms which were promptly placed in the window box. Now that the old planter has been rejuvenated with fresh blooms, it is ready for the next few years of beautifying the center. We continued the floral theme with a cute little hydrangea gift box perfect for filling with sweet treats or a small gift. The box was topped with a beautiful paper hydrangea painstakingly created by pinning one floret at a time onto a styrofoam hemisphere. Once again my crafters met the challenge head on and were rewarded with a unique gift. By using leftovers of the hydrangea box project, I made a springtime wreath featuring hydrangea balls, a variety of stylized leaves and a large decorative bow embellished with flowers, ribbons and leaves. Every so often I'll do something like this, just for the hell of it and because I find it personally satisfying and relaxing. Then I give it away. This wreath is going to the senior center to become part of the ever expanding seasonal decorating I do for them every year. I've been on a whirlwind the past six weeks that is showing no signs of slowing down, like a train with no brakes. The next week or so will be dominated with the Easter and Passover holidays so I am taking advantage of the down time to do a little something for myself. This Easter weekend I'm going up to my mountain house with my husband and his mother to open the house for the season. I'm so looking forward to seeing the sunshine on the pond, the green landscape and the blue sky above. My back is already aching from all the work I'll be doing there but no matter. I'll just look to the green, the blue and the water and smile. I'm bewildered by the speed at which life is moving nowadays. Seems yesterday I was talking about the Lunar New Year. Now Valentine's Day has come and gone and President's Day is a day away. I'd better get moving before Christmas sneaks up on me again. We've done a number of projects at the Dorchester Senior Citizens Center, some guided and others self-directed. I've been moving towards providing materials and some direction and having the members express their own creativity. This approach seems to be working quite well and the ladies are loving it. I conducted a class in the art of masking to create a simple scene through the use of inks, cosmetic sponges and rubber stamps. I created a few samples of the scene using different color combinations from the limited palette we have to work with, then demonstrated how the scene was created. Then I tasked them with creating their scenes and, true to form, they came up with interpretations I never would have imagined. The scene was then used as a focal point in a minimalistic card. For Valentine's Day, we did a project I call The Queen of Hearts. The ladies were told to decorate a foam crown to express love, then I set them loose on a table loaded down with stickers, glittered foam, self-stick rhinestones and all manner of bling. My seniors, magpies all, love all that shiny stuff and they had a ball decorating their crowns. They were then displayed on the center's walls as part of the Valentine's Day decorations. There was also a swing card class, also known as the flip flop card, so named because it is cut in such a way that a central panel swings around upon opening the card to reveal what is on the back. You can be sure you won't find that at a Hallmark store. Our latest project was the one we all enjoyed the most. I cut a memory wire bracelet apart to create individual rings that were used to make beaded key rings that can be worn on the wrist like a bracelet. After years of collecting beads, I had literally thousand of beads at my disposal, at least half of which I placed on the table for them to use. The sight of all those beads must have made their creative juices flow because they dove into the project like excited school children. They liked it enough to make two rings each, many of which were intended for grandchildren, nieces and nephews. This was one of the biggest classes to date, so much so that a couple of late comers had no place to sit at the table and had to walk away, sad to miss out on the fun. You can tell from the smiles on their faces that they really enjoyed themselves. The best part of this class came at the end. After I took their picture, I announced that my birthday was coming up and I wanted a birthday hug from my "girls". Well, they gave a communal yell of approval and lined up as if I was a visiting rock star. Every one of them gave me the warmest, most sincere smiles, hugs and kisses as they filed by, one at a time. By the last embrace I was almost in tears, so full was I of gratitude and joy at being in the company of such wonderful people. If I'm being honest with myself, I run this class as much for my enjoyment as for theirs. If I'm really being honest, I probably enjoy it more. 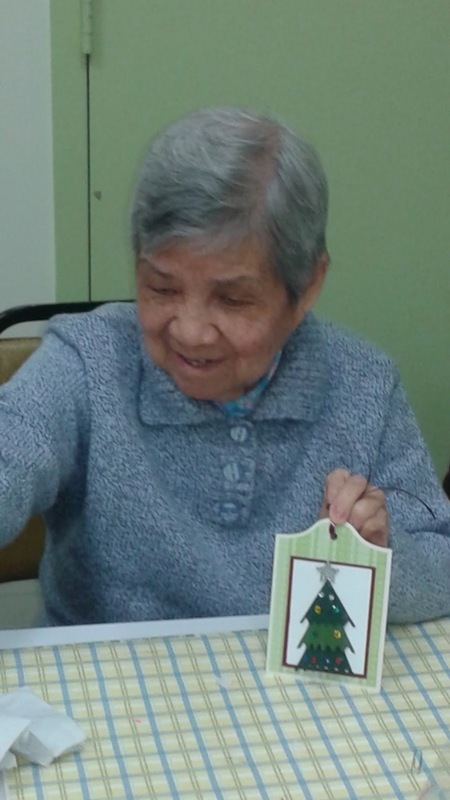 In the midst of running a household, preparing and conducting a weekly crafts class for senior citizens and ferrying my elderly parents to a variety of medical appointments, there is very little time for me to do that which fulfills me in a personal way. Yes, the senior crafting is wonderfully gratifying but I am keenly aware that I do that primarily for them, not for me. So every once in a while I have to take a step back and do something to satisfy my inner creative beast. Recently, I came across some new cutting files by one of my favorite artists, Monica Bjork. She creates the most intricate cutting patterns for paper crafters. The best part is her files are free! She gives them away to anyone who wants them. In checking out her newest files, I found this wonderfully detailed file in her Lattice Files category. One look told me I wanted to use this file as the basis for a Valentine's wall poster. Here you can see the before and after photos of my endeavor. I was very pleased with the way it came out. None of the elements were mounted on foam tape to make them stand out. I used ink shading and manipulation of the paper to make them pop off the page and appear three dimensional. The finished size is 12" x 12". 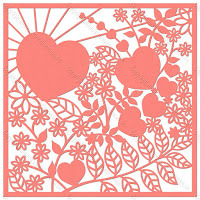 Labels: 3-D, cutting file, Monica Bjork, poster, three dimensional, Valentine, wall decoration. 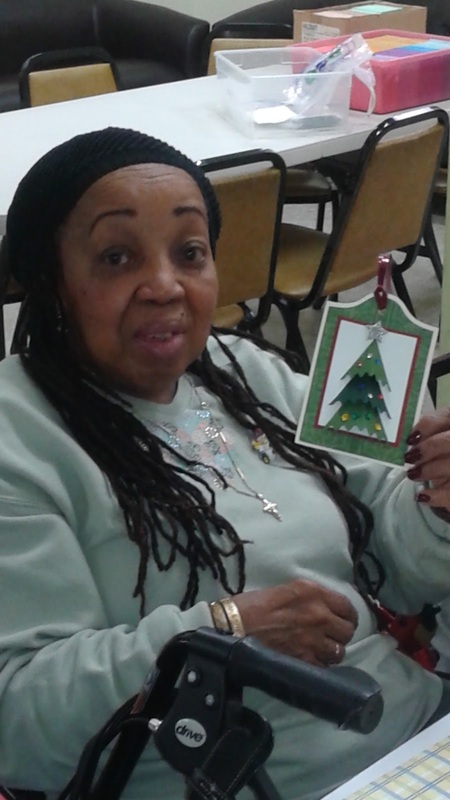 The Christmas and New Year's celebrations have come and gone but at the Dorchester Senior Citizens Center we're still in the holiday spirit. With our sizable Asian contingent of members, we always make sure to celebrate the Lunar New Year. 2017 is the Year of the Rooster and the official start is January 28 but we're wasting no time in crafting some decorations to get our celebrations off to a beautiful start. No Asian celebration is complete without lanterns so for this project we created a faux lantern adorned with an ornate rooster on one side and the corresponding Chinese symbol on the other. I took pains to use culturally traditional and appropriate colors and to make sure that no one assembled the kanji symbol incorrectly or inadvertently placed upside down. (Of course my Asian ladies knew the proper orientation.) I was complimented on the accuracy of the symbol by my Chinese crafters who painstakingly placed every stroke in its proper place. Everyone was a bit disappointed when I told them the lanterns would not be going home with them until the end of the month as they were created to decorate the center but they all proudly handed them to me so they could be displayed. As you can see from the photos, the Asians weren't the only ones who enjoyed creating the lanterns. One of my crafty ladies learned to create a beaded rooster to celebrate the New Year and she gave it to me. I absolutely love it. I learned another cultural tidbit. Some of my crafters are Russian. They told me that January 6, traditionally known in the United States as Epiphany or Three Kings Day, is the day they celebrate as Christmas and there was Christmas music playing in the background as we made our lanterns. As a Latina, I know that Latin Americans celebrate El Día de Los Reyes Mago (Day of The Magi or Three King's Day) as well. Gotta love all this cultural diversity. While the major holidays may be over, there's still plenty to celebrate in the weeks and months ahead. There are hearts on the horizon. Valentine's Day soon come.